"Love will prevail as long as there is music and merrymaking," wrote Dutch poet Jacob Cats in the 1600s; this painting exemplifies Cats's slogan. 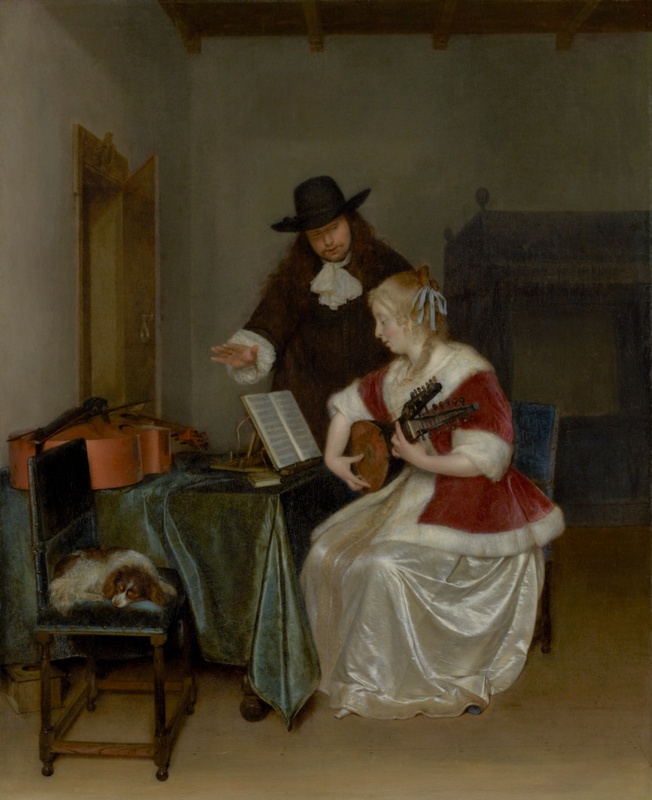 As the elegantly dressed woman plays the lute, a man, who may be her instructor, keeps rhythm and time with his hand. The foot warmer in the lower left corner symbolizes love, and the bed suggests an amorous relationship between the man and woman, maybe even seduction. Gerard ter Borch always set a mood, creating a subtle psychological interplay between the people in his intimate paintings. He delighted in meticulously describing and contrasting varied textures: the soft pile of the woman's velvet jacket, distinguished from its plump white fur trim; the shimmer of her pearl-colored satin dress; the dog's soft, wavy fur; and the variations of wood grain in the cello, furniture, and floor. He noticed even the most minute details, such as the nails in the floorboards and the brass door handle. Ter Borch created about eleven paintings of female lute players, often repeating the motifs of the woman in the satin gown and fur-trimmed jacket, the dog, the foot warmer, the four-poster bed in the background, and the partially opened door. Charles Heusch, by inheritance to Frederick Heusch. Source: Michael Hall, curator of Rothschild collection. Frederick Heusch, sold to Lionel (Nathan) de Rothschild, 1871. Baron Lionel (Nathan) de Rothschild, 1808 - 1879, by inheritance to his wife, Charlotte de Rothschild, 1879. Charlotte de Rothschild, née von Rothschild, Austrian, 1819 - 1884, by bequest to her son, Alfred (Charles) de Rothschild, 1882. Alfred (Charles) de Rothschild, 1842 - 1918 (Seamore Place, England), by inheritance to his nephew, Lionel (Nathan) de Rothschild, 1918. Lionel (Nathan) de Rothschild, 1882 - 1942 (Exbury, Hampshire, England), by inheritance to his son, Edmund (Leopold) de Rothschild, 1942. Edmund (Leopold) de Rothschild, English, 1916 - 2009, sold to Tancred Borenius, April 15, 1942. Source: Michael Hall, curator of Rothschild collection; Rothschild Archive London, Rothschild family, Lionel 228/147. Tancred Borenius, 1885 - 1948 and possibly W. E. Duits, Ltd. (London, England), sold to John Enrico Fattorini, probably 1942. John Enrico Fattorini, 1878 - 1949 (Bradford, Yorkshire, England), probably by inheritance to his daughter, Agnes Elizabeth (Fattorini) Roach. Agnes Elizabeth (Fattorini) Roach, 1908 - 1995, sold, Sotheby's, London, July 3, 1997, lot 7, to the J. Paul Getty Museum. Zeger Hasebroek, Leiden. Catalogus van uitmuntende en zeer Konstige Schilderyen van Vermaarde Nederlandsche Meesters. April 26, 1763, p. 43, lot 37 (possibly Getty painting). Henri de Neck, Brussels. Riche et précieuse collection de tableaux des meilleurs et plus célèbres Maîtres des Ecoles d'Italie, des Pays-Bas & de France, qui composent le Cabinet de Feu Messire Gabriel-François-Joseph de Verhulst [...]. August 16, 1779, p. 17, lot 84. Skinner and Dyke, London. A Catalogue of all that Noble & Superlatively Assemblage of Valuable Pictures, Miniatures, and Prints, the Property of the Right Hon. Charles Alexandre De Calonne, Late Prime Minister of France [...]. March 23-28, 1795, p. 28, lot. 32. Leroux, Paris. Catalogue d'une magnifique collection de tableaux de premier ordre, des maîtres les plus distingués des écoles italienne, espagnole, hollandaise, flamands, et française. February 28, 1825, pp. 2, 26, lot 39. Smith, John. A Catalogue Raisonné of the Works of the Most Eminent Dutch, Flemish, and French Painters [...]. 9 vols. (London: Smith and Son, 1829-42), vol. 4 (1833), p. 124, no. 20. Foster and Son, London. Catalogue of the Entire and Extremely Choice Collection of Pictures of the Italian, Flemish, Dutch, French and English Schools Formed During the Last Quarter of a Century by the Late Mr. Peacock [...]. February 28-29, 1844, p. 4, lot 12 (possibly Getty painting). Waagen, Gustav Friedrich. Treasures of Art in Great Britian: Being an Account of the Chief Collections of Paintings, Drawings, Sculptures, Illuminated Mss., &c., &c. 3 vols. (London: John Murray, 1854), vol. 2, p. 116. Exhibition of the Works of the Old Masters [...], exh. cat. (London: Royal Academy of Arts, with William Clowes & Sons, 1871), p. 14, no. 142. Hellens, Franz. Gérard Terborch (Brussels: G. Van Oest & Cie., 1911), p. 124. Hofstede de Groot, Cornelis. A Catalogue Raisonné of the Works of the Most Eminent Dutch Painters of the Seventeenth Century, Based on the Works of John Smith. Edward G. Hawke, ed. and trans. (London: Macmillan and Co., 1908-27), vol. 5 (1913), pp. 47-48, no. 130. Exhibition of Works by Dutch Masters of the Seventeenth Century, exh. cat. (Liverpool: Liverpool City School of Art, 1944), unpaginated, no. 20, ill.
Waterhouse, Ellis Kirkham. Notebooks. Vol. 29 (Los Angeles: Getty Research Institute) accession no. 870204, p. 42 (February 2,1938). Dutch Pictures 1450-1750: Winter Exhibition, 1952-53, exh. cat. 4th ed. [illustrated souvenir] (London: Royal Academy of Arts, 1952), p. 78, no. 407. Gudlaugsson, Sturla J. Gerard Ter Borch. 2 vols. (The Hague: Martinus Nijhoff, 1959-60), vol. 1 (1959), pp. 146-47, 355, fig. 221. Gudlaugsson, Sturla J. Gerard Ter Borch. 2 vols. (The Hague: Martinus Nijhoff, 1959-60), vol. 2 (1960), p. 203, no. 221.I. Hendy, Philip. European and American Paintings in the Isabella Stewart Gardner Museum (Boston: Isabella Stewart Gardner Museum, 1974), p. 34. Sonnema, Roy Brian. "Representations of music in seventeenth century Dutch painting." Ph.D. diss. (University of California, Berkeley, 1990), pp. 171, 356, no. 87. Sutton, Peter C. Dutch and Flemish Seventeenth-Century Paintings: The Harold Samuel Collection (Cambridge: Cambridge University Press, 1992), pp. 32-33, under cat. no. 7, fig. 3. Jaffé, David. Summary Catalogue of European Paintings in the J. Paul Getty Museum (Los Angeles: J. Paul Getty Museum, 1997), p. 12, ill.
"A Selection of 1997 Museum Acquisitions." Apollo 146, no. 430 (December 1997), p. 7, ill.
Gribbon, Deborah. "Selected Acquisitions Made by the J. Paul Getty Museum, 1995-97." Burlington Magazine 139, no. 1136 (November 1997), p. 826, ill.
Sotheby's, London. Old Master Paintings. July 3, 1997, pp. 20-23, lot 7, ill.
Barker, Godfrey and Laura Stewart. "A rush into Old Masters." The Daily Telegraph [London] (July 7, 1997), p. 5, ill.
Schulze, Sabine, et al. Innenleben. Die Kunst des Interieurs. Vermeer bis Kabakov, exh. cat. (Ostfildern: Hatje, 1998), pp. 58-59, no. 12, ill., entry by Bettina Werche. Sotheby's London. Old Master Paintings, Part One. December, 8, 2004, pp. 62-63, ill.
Elliott, Virgil. Traditional Oil Painting: Advanced Techniques and Concepts from the Renaissance to the Present (New York: Watson-Guptill, 2007), pp. 12-13, ill. The J. Paul Getty Museum Handbook of the Collections. 7th ed. (Los Angeles: J. Paul Getty Museum, 2007), p. 111, ill.
Ho, Angela Ka Yan. "Rethinking Repetition: Constructing Value in Dutch Genre Painting 1650s to 1670s." Ph.D. diss. (University of Michigan, 2007), pp. 109, 266, fig. 4.16. Christie's, London. Old Master & 19th Century Paintings, Drawings & Watercolours. July 6, 2010, pp. 128-29, under lot 47.